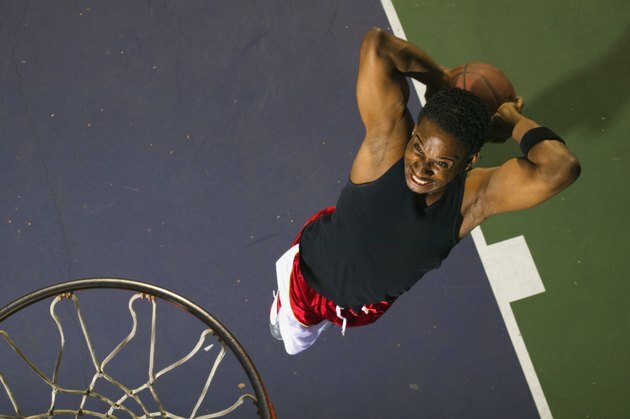 Increasing your ability to jump high can help to set you apart from the competition and allow you to excel in sports like basketball, tennis, volleyball and gymnastics. Exploding off of the ground and high into the air requires a combination of power, force and strength. A fitness program that cultivates these aspects through plyometric exercises, resistance training and core exercises can help to increase your jump by 6 to 14 inches. Compound exercises -- like squats and lunges -- engage more than one muscle group at a time. Along with increasing strength, compound exercises train different muscle groups to work together, just as the quadriceps, calves, hamstrings and glutes do during a vertical jump. Squats, lunges, deadlifts and step-ups, performed using barbells, dumbbells or kettlebells, are all compound exercises that can help to increase your strength for jumping. Incorporating exercises that target your abdominal muscles, lower back, pelvis and hips into your training program can help your body to remain balanced and stable when jumping. A variety of crunches on a stability ball, bicycle crunches and reverse crunches will work your abs. Supermans, planks and bird-dogs can help to strengthen your lower back and the transversus abdominis, which is the deep-seated abdominal muscle. Side planks with a leg lift can work your hips. And bridges strengthen the entirety of your core. Lower-body plyometric exercises, such as jump squats and box jumps, use the same explosive movements as vertical jumping and can therefore help to increase the height of your jumps. For squat jumps, lower down into a squat position with your feet shoulder-width apart and explode upwards as high as possible. For box jumps, jump up onto the top of a box, gym bench or other stable surface and then back down. Gradually increasing the height of the box by 1 or 2 inches at a time can help you to progress toward your goal of increasing your vertical jump by 6 to 14 inches. Make sure you are able to jump and land on the box using proper form before you advance to a higher height. Perform a dynamic warm-up -- consisting of jogging, jumping rope, knee lifts and single-leg hops -- for five to 10 minutes before training. Perform strengthening exercises two to three days per week; workouts should consist of two to three exercises per muscle group. Complete three sets per exercise. Use resistance levels that allow you to complete at least eight but not more than 12 repetitions with proper form. Consult with a physician before starting a new fitness program.